Scientists from the Paleontological Institute of the Russian Academy of Sciences and their foreign partners found in the US and Burma the remains of extremely unusual ancient insects, similar to ants, bees and wasps, but are cockroaches. Their findings were presented in the journal Biologia. “This form of mimicry is extremely rare among modern cockroaches – only a few of their species now copies the appearance of a few bugs we have shown that in the past, cockroaches do not just have the ability to mimic, but also imitated to several predatory insects, changing along with them.” – write Daniil Aristov from the Paleontological Institute of the Russian Academy of Sciences in Moscow and his colleagues. Many insects, snakes and other animals developed during the evolution of various types of “disguise,” which are called mimicry. As a rule, harmless insects try to imitate the poisonous or predatory species, or they try to merge with the environment. A striking example of this behavior are insect-stick, almost indistinguishable in color and shape from twigs or dry leaves. The first insects that possess such a “superpower”, as the petrified prints of their bodies show, appeared about 125 million years ago, back in the time of dinosaurs and before the appearance of floral plants. How and why it happened is still the subject of fierce discussions among specialists. 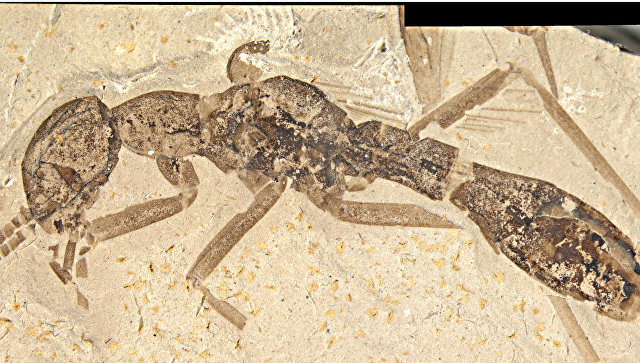 Aristov and colleagues carried out a kind of “census” of already known species mimic ancient insects, and looking for new fossils of such creatures, studying the museum’s storerooms, which kept the fossils since the end of the Mesozoic and early Cenozoic, modern geological era. In one of these museums, Aristov discovered fingerprints of a curious “ant” about 2.4 centimeters in length. He lived on Earth about 47 million years ago, during the Eocene era. His unusual appearance forced scientists to enlighten him with the help of three-dimensional scanners and restore the three-dimensional structure of his body. It turned out that the “ant” was actually a member of the group of so-called alienopter, tarakanopodobnyh invertebrates, like at the same time and on the cockroaches, mantises and its origin, lifestyle and diet. In addition to “cockroach”, named Grant viridifluvius, this group, as Aristov and his colleagues found, included many other insects that copied the appearance of other hymenoptera. Interestingly, their study and comparison shows that the nature of their camouflage reflects the diversity and prevalence of the predators they copy at the time when each of these species of cockroaches existed. In other words, they disappeared and appeared along with those dangerous species of bees, wasps and ants, which they copied. While the main mystery is why modern cockroaches do not have such a “superpower”, and why all representatives of alienopter died out without leaving descendants. As scientists hope, further excavation will help them find the answer to this question.